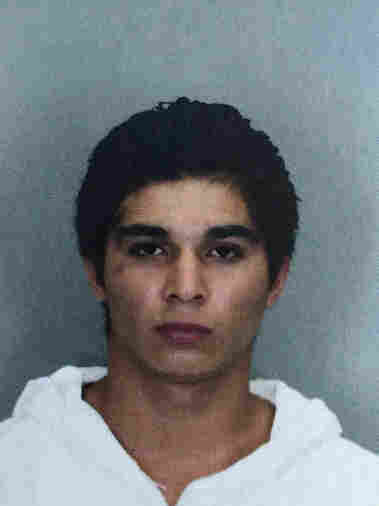 Man Charged In Killing Of Muslim Teenager In Virginia : The Two-Way Darwin A. Martinez Torres, 22, is accused of killing Nabra Hassanen of Reston, Va., who was reportedly walking with her friends back to a mosque after getting breakfast early Sunday. Police have arrested and charged a man in the murder of a Muslim teenaged girl who went missing early Sunday morning in northern Virginia. Authorities haven't released details of how Nabra Hassanen of Reston, Va., died but tweeted that they are not investigating the killing as a hate crime. Hassanen and four or five others teenagers had left the All Dulles Area Muslim Society (ADAMS) mosque in Sterling, Va., on Sunday to get breakfast at an IHOP a little more than a mile away, The Washington Post reports, citing accounts from police and a mosque official. Fairfax County police say the teenagers were walking back to the mosque when they got into a dispute with a man in a car. Authorities say the suspect, 22-year-old Darwin A. Martinez Torres, got out of the car and assaulted Hassanen, whose age has been reported as 16 and 17. The Post reports that the teenagers ran to the mosque but that Hassanen wasn't with them. Her friends reported her missing at around 4 a.m. ET, and police began conducting an extensive search of the area using a police helicopter, K-9 teams and search and rescue teams. During the search, according to police, an officer noticed a car being driven suspiciously. The driver, identified as Torres, was arrested as a suspect in Hassanen's disappearance. Police say they found remains of a female in a nearby pond around 3 p.m. that day; the medical examiner's office will conduct an autopsy in order to identify the remains and the cause and manner of death. Fairfax County police spokesman Don Gotthardt told NPR that while the department has no indication so far that Hassanen's murder is a bias or hate-related crime, it will take all evidence into account. "The fortunate thing is we have someone under arrest, and we will be very, very meticulous in our investigation," Gotthardt said. Shoyeb Hassan, co-chair of ADAMS, told the Post that during the last 10 days of Ramadan, "the mosque has extra prayers at midnight and 2 a.m., and members frequently go to McDonald's or the 24-hour IHOP to eat before they start their fast at sunrise, as Nabra and her friends were doing." Hassanen's mother told the Post that detectives said the girl had been struck with a metal bat. Sawsan Gazzar said her daughter had borrowed an abaya from her to wear to Ramadan services at the mosque on Saturday night, as she "wasn't ordinarily religiously observant", according to the newspaper. Gazzar said a detective had told her that Hassanen had tripped over the long dress and fallen to the ground before she was hit. "I think it had to do with the way she was dressed and the fact that she's Muslim," Gazzar told the newspaper. "Why would you kill a kid? What did my daughter do to deserve this?" "We are devastated and heartbroken as our community undergoes and processes this traumatic event," Imam Mohamed Magid, executive imam at ADAMS, said in a statement. "It is a time for us to come together to pray and care for our youth." U.S. Rep. Barbara Comstock of Virginia said in a statement: "We are heartbroken and horrified by the news of the brutal murder of a beautiful 17-year old girl. We know there is no greater pain for any parent and Chip and I extend our prayers to her family and loved ones at this difficult time and the entire ADAMS Center community." Virginia Gov. Terry McAuliffe tweeted, "Dorothy & I are heartbroken over this senseless act of violence. We are praying for Nabra's family & ADAMS Community." A crowdfunding campaign set up to raise money for Hassanen's family had already collected more than $160,000 as of Monday afternoon.